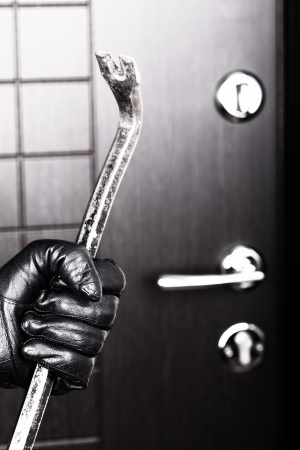 The possibility of having someone break in to your home is one that all home owners will worry about. Luckily for you, there are some small things that you can do to discourage this from ever happening. Don’t show off your possessions. Leaving things like bikes or scooters is like an invitation for thieves to come take your things. Take a minute to put all of your belongings away, or at least tuck them away in a shed or garage. If burglars think that there is someone home, they are far less likely to try to get into your home. There are a couple ways you can create the illusion that someone is home. You can leave the light or the TV on to give the impression that someone is still inside. Putting a home security system sign in your yard (whether you have the service or not) can help deter them as well. There are many sliding doors can be popped off the frame and broken into even when they are locked. There is an extra precaution you can take in order to make sure this doesn’t happen: stick a two by four or a steel bar into the track, in the groove where the door slides. Even if they pick the lock, they won’t be able to fully open the door to get in. The same goes with windows. You should always check to make sure you lock every potential entrance, but this would provide an extra measure. Instead of hiding your spare key somewhere on the premise, give a spare to a neighbor or friend that you trust. Not only could someone find the key if you put it in an obvious spot, but if they do find it, they would have no struggle. People can also spot you getting your key out of its place, inviting them to do the same. Make your friend less burglar friendly. Tall shrubs, trees, and bushes can make it pretty easy for someone to hide and wait for you to leave. Check your lawn and see if there are lots of hiding places. Have someone come by the house whenever you are on vacation. Having a pile up of mail or newspapers can alert others that you haven’t been home in a while. Having someone check in on this for you can save you a lot of trouble. If you need some more tips for keeping your home safe, check out Leading Edge Home Security today!